"That's the ocean, not the bay." 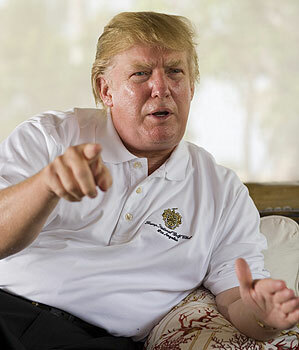 Looking pink, bloated and determined to win the What-John-Daly Will-Look-Like-On-The Champions Tour-If-He-Lives-That-Long Contest, The Donald sat down for an all-too-frequent Q&A wth Golf Magazine's Michael Walker to plug his various golf courses and other assorted ventures. Q Trump L.A. is better than Pebble Beach! Are you crazy? A That's what people say until they play my course. I have 3,000 acres and 2.5 miles on the ocean. And why is that the course is jammed into only 110 acres? That's the ocean, not the bay. Every single hole fronts the ocean. I love Pebble too, but even people who love Pebble say Trump L.A. is superior to Pebble. What Pebble Beach has is history and some day Trump L.A. will have history, though I might not be around to see it. Trump L.A. is also far better than Bandon Dunes [in Oregon]. It's unfair to compare a course in Los Angeles, a great metropolitan area, to one in a wasteland far away from civilization. LA's no wasteland, that's right Donald. Of course the drive from LAX to Trump National takes about the same amount of time as Portland to Bandon thanks to our traffic, but who cares when you can drive Crenshaw Boulevard! Q A web site (TMZ.com) published pictures of you playing at your L.A. course and claimed they showed you giving yourself an illegal drop. Did you see that?